One of the things that I get asked most often is "What is your nail care routine?" I don't think I've ever done a post dedicated to the whole lineup of products that I use and how I use them, so I figured I would take the time to share now. These are just the products I use to care for my nails, so I won't be talking about topcoats, base coats, etc here. Keep an eye out for that post in the future though! If I had to pick just one nail care item to use for the rest of my life, it would be mah Burt's. I've used a bunch of cuticle care products over the last two years but I always come back to this one, and I'll tell you why. First of all, it does a damn good job. It melts right in to my cuticles and keeps them hydrated nicely. While it may feel a little grainy coming out of the container, when I massage it into my nail area it's soft and smooth without being too greasy or slick (I'm looking at you, LUSH Lemony Flutter). Second, I love the purse-ready tin. Things have to be pretty robust to hold up in my purse and Burt's has proven tough. Third, one tin lasts for-ev-er. I apply it daily and I have no problem getting at least six months out of every tin. After you've let it soften your cuticles, you can also gently push them back for a neater appearance. Rejuvacote is like a miracle product. Similar to OPI Nail Envy, Rejuvacote is a product that you apply directly to the nail to improve strength and nail health. I like to wear a coat of it under every manicure. Some people wear it in place of base coat -- I choose to stack them together! Rejuvacote first and then my base coat of choice second. Since I've been using it, Rejuvacote has helped to almost completely eliminate nail breaks and sometimes I feel like it makes them grow faster, too! You can find it on Ninja Polish and Amazon.com. I also heard a rumor this was going to be stocked in Wal Mart but have yet to see it there. I apply hand lotion/hand cream at least twice a day, and this is the one area of my routine where there's a lot of variation. I have so many hand moisturization products that I just leave them all over the place. That way, I always have one nearby! I usually use a thicker cream at night time and a more lightweight lotion during the day. I don't think the specific product matters so much here as long as your hands are getting the moisture. 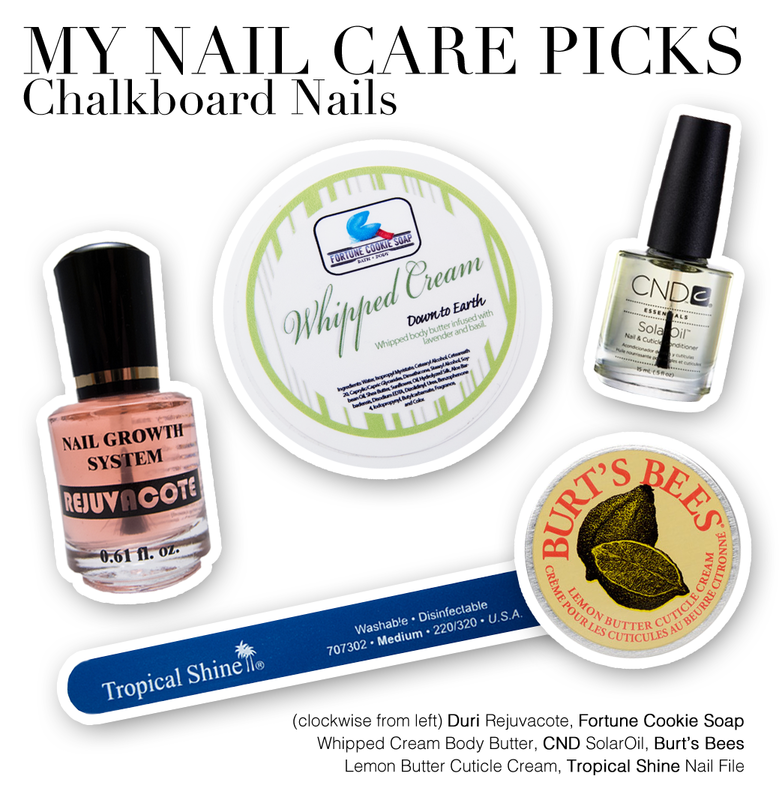 Favorites include: Fortune Cookie Soap's Whipped Cream Body Butter & OPI Avojuice. I prefer cuticle cream to cuticle oil for everyday use, but when my nails need a little bit of extra pampering, I'll reach for my CND SolarOil. It seems to condition my cuticles really nicely and smells DELICIOUS (it's the sweet almond oil!). It also absorbs more quickly than the other oils that I've tried. Definitely a win! Now, I'm no file expert and I'm certainly not a trained manicurist, but I figured I'd include this anyway. My go-to file is a 220 grit Tropical Shine file that I purchased at Sally Beauty. However, the grit you need will be dependent on the condition and strength of your nails, so stop by Kayla's post about nail files for more information. Remember, never saw back and forth with your nail file. Only file in one direction. Don't pick off your nail polish! Just don't! I know it's tempting, but picking polish is really damaging to your nails and can cause them to grow out weaker. I'll admit that I get a little antsy sometimes and commit this greatest of sins too, but really try to make an effort to avoid it. The products that work for me may not work as well for you! I have faith in these products and think that most people will find them effective, but if something doesn't seem to be working right, do some research on other alternatives. Makeupalley.com is a good resource for product reviews if you want to poke around before you buy. A new cuticle care routine may take a little while to start showing results. Be patient and stick with it and you should see some changes! If you have ragged skin around your nail beds, try softening and conditioning the area with some cuticle cream or oil before you reach for the nippers. Cuticle nippers are easy to go overboard with, and for many people, they aren't even necessary. Questions? Like I said, I'm not a licensed nail tech, but if you have questions about these products, please feel free to ask in the comments or email me. I'll do my best to answer them for you! The Burts Bees Cuticle Butter is BEST ♥ I LOVE IT! Okay first of all ,I totally agree with the Burts Bees Lemon Butter ! I absolutely adore that stuff!!! Cannot live without it! Second my oil of choice is Juleps Roll-on cuticle oil! I sometimes carry it around in my pocket>>>>: It gets it warm and it applies so goood and rubs in and feels great! And third , I am also a Hand Moisturizer junkie! I have it stashed all over the house!!! I am so into taking care of my hand and feet!!! I just wished earlier in life I would have never started popping my knuckles! It is a terrible habit with irreversible effects!!!! I And now if I don't do it my fingers ache ! So anyway you were my very 1st nail blogger I followed and are still one of my Top Three!! !N Keep up the great work! Oh and btw you have great hand and nails!!! forcing more blοоԁ thгoughout youг body. Great post. I have the Burt's Bees at work and I forgot to mention that in mine.... your nails and cuticles are gorgeous so I'm sure lots of people are taking notes :) Have a great day. Great post! I got Burt Bee's cuticle oil from this cute little hand kit I found on clearance- great product and thanks for sharing your routine! I saw Rejuvocate in WalMart just yesterday. Great Post! Thanks for the post Sarah! I am definitely an avid believer in cuticle care. I used to constantly pick at my hangnails.. raw skin exposed.. it was gruesome. But after about 5 months of consistent cuticle care, my nails grow strong and not a single hangnail! I too prefer Burt's over Lush. And when I think Rejuvacote I think Chalkboard Nails lol! I finally got my own bottle, its only been a week but I think its gonna be a staple. I know you use your nail on your opposite hand to push back your cuticles, but do you ever use a remover, or does Burts get the job done for you? Nope, I never use cuticle remover. Burt's is a miracle! Since I am so sensitive to any kind of strong smell, I make my own cuticle/facial oil: 1/3 jojoba oil, 1/3 macadamia nut oil, and 1/3 evening primrose oil. (Just a couple of drops rubbed over my face makes my mineral sunscreen glide right on, so I'm not trying to rub it in for 15 minutes!) I bought a few black polish bottles off evilbay, and use the dropper from my facial bottle to fill them when they get low. I also use this on the underside of my nails, since they are so curved it is impossible to get anything but oil under them. Without one, you will not maximizing your workout time. By not obtaining past this deliberate blocker, you would not get a large number of sales. thank you for sharing this knowledge. How do you keep the nail polish to last longer because I do a lot with my hands like washing and working with them. Using a good base coat and wrapping the polish on the tips of your nails can help a lot, but unfortunately those kinds of activities shorten the wear of polish a lot. You could also try getting a clear Gel polish applied to your nails and painting over it, I heard that can help the wear. I like CND Stickey a lot, but different base coats will work differently on each person. rejuvacote is amazeballs. they also sell it at bed, bath & beyond. i love how you mention that everyone is different, & not everything works for everybody. soo true. will definitely try the burt bee's though. Thank you for this post! I'm definitely going to check out the Burt's Bees cuticle cream; I think it's about time I found a good one! I, too, am in love with the Burts Bees cuticle cream. It does wonders for me! Thanks for the tips ! I personnaly use Crabtree and Evelyn hand cream (with myrrh extract for the nails) and it's very good ! Been stalking the site for a while and accidentally happened upon this. I've been trying to find a nice, suitable day routine for my nails that's not too heavy. Immediately went out and got some Burts Bees Cuticle Cream. After trying a plethora of different potions this had cured my evil nasty cuticle blight in just over a week. You are, as ever a genius! Now I need to find some rejuvacote in the UK! As soon as I read this I went out and bough a tin of Burt's Bees cuticle cream! I love my Lemony Flutter but the greasiness can be too much, so now it's reserved to my before bed moisturizing. Love your blog! Thanks for the scoop on your favorite products! I have used the Burts stuff in the past and it is awesome. (Have some cuticle oil I need to use up first.) I keep cuticle oil at my desk and on my nightstand. I agree - it's all about consistency! I recently helped my daughter paint her bedroom. To help clean off the paint, I made a scrub of olive oil, sugar and a bit of lemon juice. It worked really well, got my nails nice and white and really helped my skin look smoother. Sounds lovely! I've tried DIY scrubs a few times too, but generally have found that I don't have the knack for it. I'm so glad I've found your blog! It's awesome. I like to moisturize my hands as a stop-gap during the day because it's easier and faster than reapplying cuticle balm, and helps to moisturize my cuticles and nails, too. You could definitely just keep reapplying your balm or oil if that's what you prefer. Of course, you're right in that it does make your hands look and feel nicer, too. I can't say for sure if *just* moisturizing your hands (not rubbing the lotion specifically into your cuticles) provides a benefit for your nails or not. I found that Burt's Bees cutical butter actually made my nails and cuticles much drier and they peeled more.